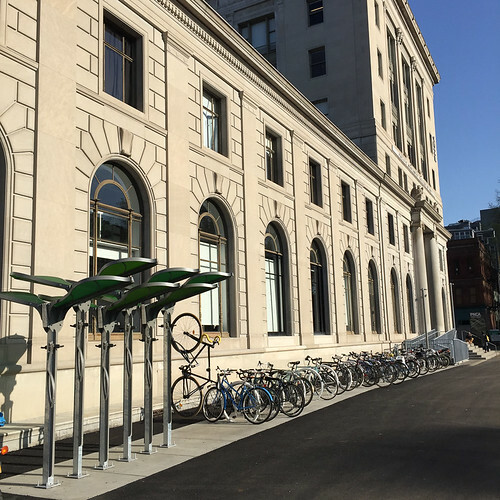 On-street bike corrals, temporary bike parking, valet bike parking, bike parking shortages, and more! Click the headlines below to read full articles. Posted on May 20th, 2016 at 10:12 am. The valet in 2012. It’s co-funded by OHSU and the private bike shop that operates nearby. 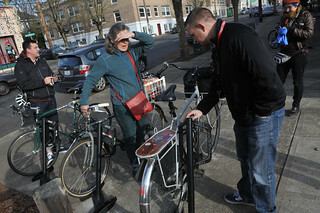 One of Portland’s most unusual experiments in privately funded bike promotion keeps growing and growing. Posted on May 13th, 2016 at 10:16 am. Posted on March 8th, 2016 at 9:25 am. BikePortland’s bike parking coverage is sponsored by Huntco Site Furnishings. 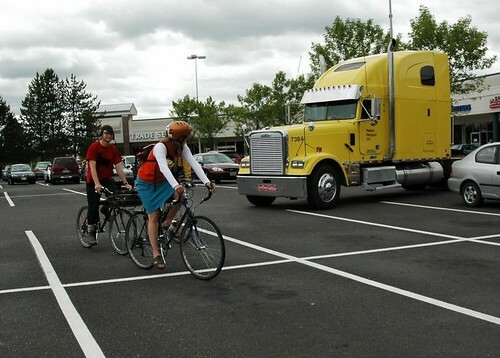 Suburban parking lots often fail horribly at bike parking — not because it’s expensive but simply because developers weren’t thinking about it. But as hundreds of Portland retailers can testify, decent bike parking is a big part of making a business district bike-friendly. It’s a key part of making it feel natural and normal to go out for an errand, a beer, a meeting, a movie or a daycare dropoff on a bicycle. With low-car lifestyles getting more common in Washington County over the last few years, some people in the area are looking to upgrade the bike parking. That’s why the Westside Transportation Alliance is working on a project right now to select the best locations for new bike racks. Posted on December 21st, 2015 at 2:15 pm. Bikes parked outside Planet Granite on NW 14th and Pettygrove. I have a thing for bike parking. Posted on April 16th, 2015 at 10:44 am. With room for 42 bikes right up front, PNCA is doing it right. 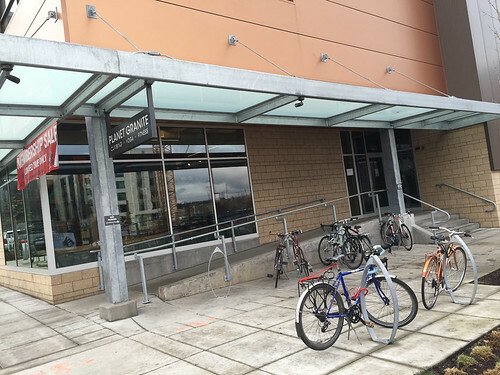 When the Pacific Northwest College of Art moved, they made sure one crucial piece of their old campus came with them: the bike parking. Posted on February 3rd, 2015 at 12:09 pm. Not going to cut it. Last week we shared the unfortunate story of new bike parking at the U.S. Bancorp Tower. It’s unfortunate because — despite a brand new, million dollar plaza renovation — whoever installed the bike racks got it completely wrong (we’re still waiting to hear back from the architecture firm that led the project). That story had us checking the City of Portland code to see if the new Bancorp Tower racks were in compliance (they appear to violate at least one Administrative Rule). On a similar note, a few weeks back we heard from reader and former City of Vancouver (WA) transportation planner Todd Boulanger. 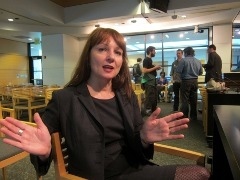 Boulanger cc’d us on an email to Sarah Figliozzi, a bicycle program specialist at PBOT. Posted on January 16th, 2015 at 2:14 pm. the features of his “bike dock”. 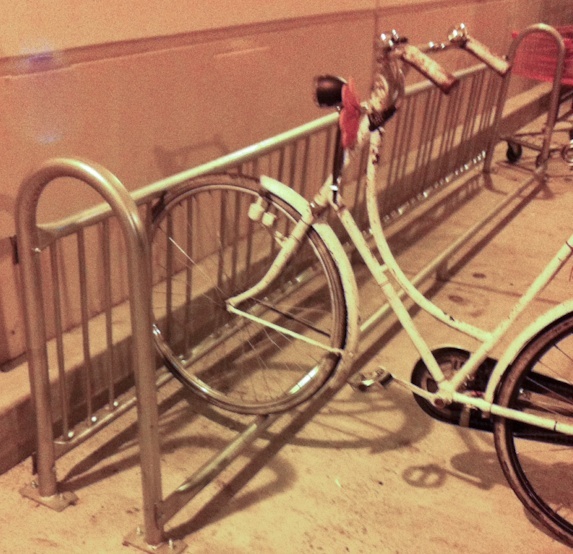 Bike thieves have upped their game and rack manufacturers see a business opportunity. Not content with using mere bolt-cutters to snip your cable lock or a mini car-jack to pry open your u-lock, thieves are now using power saws. Yes, power saws that can easily zing through the rounded pipes used in over 6,000 of those official blue “staple” Bureau of Transportation bike racks and countless street signs that people lock to when there’s no staple nearby. Posted on January 5th, 2015 at 11:27 am. 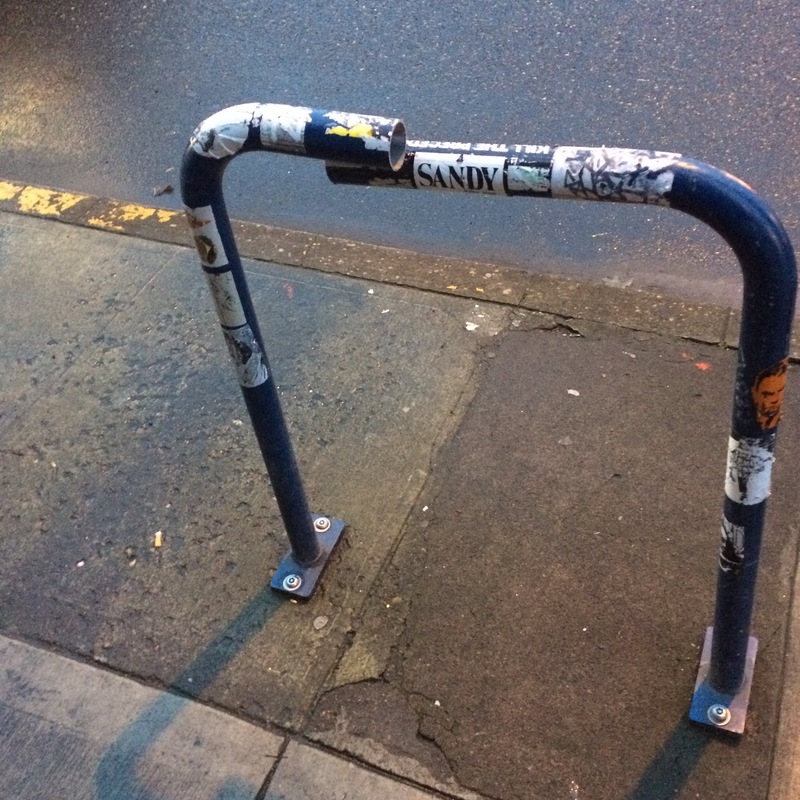 Portland thieves will stop at nothing to take your beloved bike. In the wee hours of this morning, someone sawed clean through a standard-issue City of Portland staple rack and stole a Trek Lexa road bike. Posted on October 14th, 2011 at 5:32 pm. special sneak preview of the tool today. This guest post is by Michael Andersen of Portland Afoot, PDX’s 10-minute newsmagazine and wiki for transit commuters. Already known internationally for its top-notch website and pioneering use of open data, Portland’s transit agency is about to take another leap toward making low-car life easy and intuitive. With the launch of its new Regional Trip Planner – that’s the link to the latest version, which will go live on TriMet’s website tomorrow – TriMet will be the first American transit agency whose website uses open-source software to plan trips the way low-car humans do: by figuring out the best combination of bike, train, bus, foot and even, eventually (gasp) automobile. Posted on May 25th, 2011 at 10:06 am. 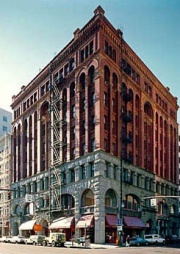 The Dekum Building on SW 3rd and Washington in downtown Portland was built in 1892. It’s the oldest office building in the city and the former home of famed global ad agency Wieden + Kennedy. 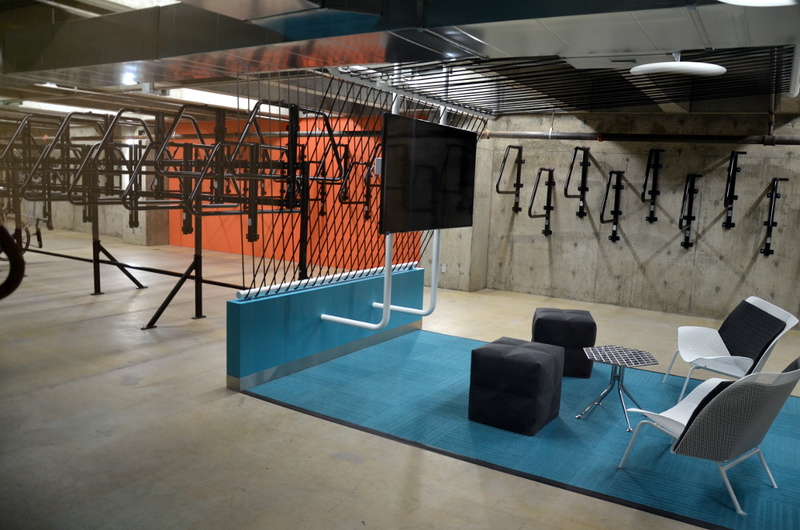 Now, building owner and manager Naito Properties hope it gains distinction as the largest public bike parking facility in Portland (and it just happens to be right across the street from the bank vault bike parking in the Spalding Building). Verne Naito, who’s managing the Dekum for his family’s company, Naito Properties (the same family Naito Parkway is named after), says the owner of the building has set aside 4,000 square feet of ground-floor retail space that has already been permitted by the city for bicycle parking and is already built out to fit 300 bicycles. 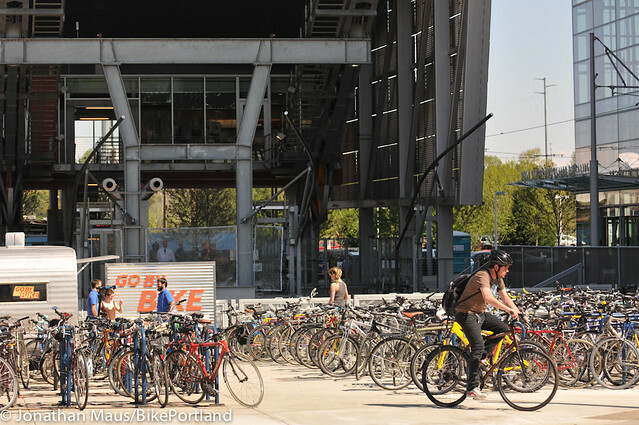 The idea would be something similar to a Bikestation, which, despite toying with the idea for years, no one in Portland has been able to pull off.